A bit of hiking in the summer heat can be great exercise. Our Clay small group took on the challenge of 2000ft. Mt. Takao last week. 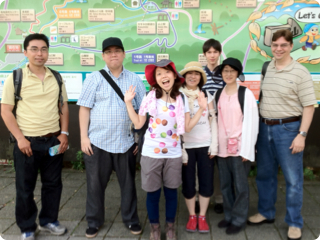 Part of the group took the cable car to scenic overlook and monkey garden. 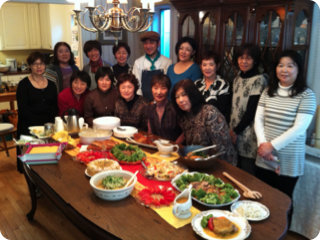 We all gathered for cold noodles afterwards and enjoyed lunch together. Great climbing, everyone! 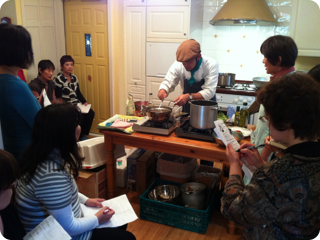 One of the best areas in the Kanto area, in our opinion, is Yamanakako near the base of Mount Fuji. 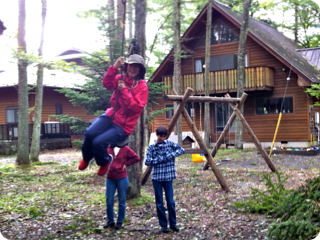 One of Denen's small groups, Clay, spent two nights and three days in the area for a fun fall retreat together. Not all of our small group members were able to attend, but those that did had a chance to learn more about each other, about God, and were able to relax and spend some time in His creation. We drove down through some leftover drizzle the day after typhoon 15 made a direct hit on Kanto. The lake water had overflowed its banks and many trees were down. That didn't stop us for enjoying the crisp fall weather. Thursday night we watched a funny movie together. 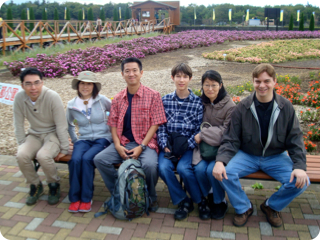 Friday after walking, cycling and lunch, we visited the local flower park (above photo), and then the local onsen. 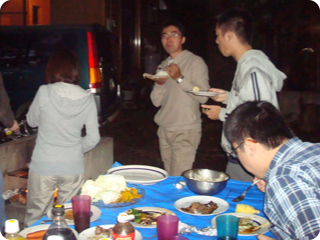 We BBQed up a great feast afterwards. For our evening meeting, Pastor Tanazawa came as a guest speaker to share about the essence of Christianity, and God's wisdom for living and working in our places of employment. After spending another leisurely morning in Yamanakako, having devotions together, we drove to a windmill on the hillside of Gotemba, a great spot for lunch. 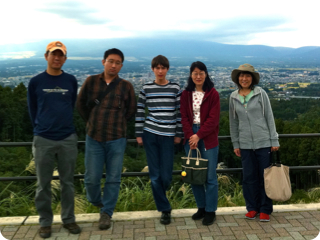 The photo below shows us in front of Mount Fuji (if it wasn't hidden by clouds). The view of the valley was breathtaking. God gave us a lot of laughs and little blessings during our time together. We're already looking forward to our next retreat together. Why don't you join us, too?